Cheap global prepaid phone card. Call Country to Country internationally or call back to the U.S. from more than 130 countries of the world. 1 minute rounding. 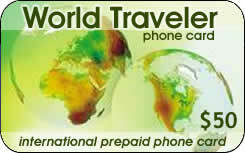 MCI World Traveler international phone card. We offer a great selection of cheap international phone cards for international and domestic long distance phone calls. Using our prepaid phone cards you can make cheap long distance, international and overseas phone calls to destinations around the globe. Cards provide low calling rates. Additional Information Network services provided by MCI. We strongly recommend you verify overseas access numbers with customer service before leaving the U.S. Does not work from international cell phone, AT&T Phone Tents on U.S. Military Bases or AT&T payphones. Calls to 700, 900, or 976 numbers, certain toll-free, operator assisted, third party billed or collect calls not available. MCI makes no express or implied representations or warranties about its services and disclaims any implied warranties. MCI's liability is limited to the face value of this Card and will not include any indirect, special, incidental, consequential, exemplary, or punitive loss or damage.